I am looking forward to this. I have not read the book but I am ordering it. Me too! I think it's going to be an awesome summer of learning! I am looking forward to this book study I have just ordered the book. Glad to have you with us Laura! That's awesome that your colleagues will be doing this too! I've red most of the first chapter Lots of great information in there. Can wait to get started the online discussions. I'm hoping to be able to use this with my colleagues in September too! I love the information about the brain. I've actually shown the pictures to my children and students and used the information in there to discuss how the brain works and why mistakes and challenges are important. To get some discussion going .. let's begin here. Dr. Boaler tells us that having a growth mindset from our learning experiences, outperform students with a fixed mindset in mathematics. Discuss the above notion – how do you feel about the notion that every student is capable of having a growth mindset and use their mistakes to help build more synapses? I think it's important to discuss how important making mistakes is in the classroom. We read a number of mentor texts to help with this (Beautiful Oops, It's OK to Make Mistakes) and engage in really in depth discussions about mistakes being a way for our brains to get smarter. I will purposely make mistakes during our first few weeks together, usually on my morning message, so that we can discuss them in relation to our read alouds and see that even adults make mistakes and it's okay! One example I can think of right now is a colleague who taught my owns kids who are now 33, 31 and 30 years old. She had never liked math, nor felt she was good at it as a child and even while she taught it for a number of years. She became a Math Consultant with our School Board, and learned more and more about the use of manipulatives and open-ended questions and finally learned to love math.. I believe that her mindset had finally changed from a fixed mindset to a growth mindset.. and that was when she was about 35 years old!! it's never too late. 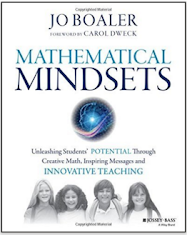 And that really embodies Boaler's belief in the book that it's never too late to learn higher level math and view oneself as a capable mathematician. It's very inspiring! 1. Coming into this book study, would you consider your self 'good' at math, is it a strength for you? Or is math something that you struggle with? How does your mindset affect the way in which you approach mathematical instruction? Growing up I had no math skills and my mom tells me it wasn't until grade 6 we actually got taught as they brought a special teacher in. I think I learned more about math during my first year of teaching grade one than I knew in 40 years before! I literally hated anything with numbers so I remember telling time was a struggle. In highschool I used to write numbers all under my sheets then erase so it looked like I tried. I really didn't get it but never took the time to. But.....in the last year or so now that I'm aware of how much my mindset affects kids I've been very careful with my negative comments about myself and finding myself trying and I can now pretty much do anything I put my mind to! Mindset definitely mattered in my case! Now I say....I can't do that.....YET! When I was a child, I loved school and everything about it, including math. I remember being so excited at the start of each school year and never really felt that there wasn't anything I couldn't do including math. However that changed for me in highschool. I had a teacher in particular who wasn't very effective at teaching the math, so I struggled with the content, and to make it worse for me (I was a very shy, quiet child) he would prewrite student names on the board and expect that person to write out the answer to the previous day's homework. There wasn't an opportunity to volunteer or pass for this. I was horrified. I didn't understand the math, knew it wasn't right, and felt so embarrassed posting my incorrect, half-finished work on the board. This did nothing to build my self-concept or interest in math and humiliated me in front of my peers. That's the point I shut down and shut math out of my life. I stopped pursuing math courses and it definitely impacted my career choices because I didn't take any university math. As an educator I realize how traumatic this type of math environment is and how essential it is for children to feel safe and secure in math classes, especially when the content is challenging and they might not understand it the first few times. Our classrooms need to be safe and supportive spaces where children know that mistakes are okay and are actually celebrated as part of the learning process. I also never force a child to answer a question or share unless they want to. I don't like to put children on the spot and know how that can stop learning. I definitely have a growth mindset now, but throughout my childhood I always had the idea that I was "bad" at math, and the teaching approach definitely encouraged this self image. I don't remember seeing a manipulative ever- we had work books and would just work through them, endless repetitive drills and the dreaded "minutes folles". Unlike Deanna, my revelation came in Grade 9 when I had a young, dynamic Math teacher. and suddenly I went from struggling to thriving. It really changed my whole attitude to numeracy. I also realize now that my mother inadvertently embedded math learning in a lot that we did at home- logic problems, cuisinaire rod play, baking, etc...and these home activities laid the foundation for my eventual embracing of math play. My background is in Visual Arts, so I find it amazing that I love teaching math so much- we are lucky to be teaching at this time when the approach is so creative and dynamic. I believe I had a fixed mindset too. But I lived math, even though it was all paper and pencil tasks. I was loving learning math but back in the 60s and 70s I found math relatively easy. It was when I was healing others I must enjoyed learning about math. I always loved math in elementary school! In second grade I wrote exams to see if I would skip the third but my parents felt it best if I remain with my peer group. As I got older I was placed outside of the classroom with a few friends to work independently as we were always ahead of the class. This continued into eighth grade... which is when things changed. I began struggling in math because teachers always saw me as "ahead" and not needing support. For the remainder of my high school career and university, I struggled immensely with mathematical concepts. From this experience I have learned how important it is to support all learners in all areas because there can be a breaking point regardless of our natural abilities. I love teaching math in the early years however as I feel very confident with the content as well as my ability to bring math to light naturally through play. I am always in search of new methods of inquiry and play-based math which is why I am so excited to be a part of this group. I have over the past year become very interested in the growth mindset concept thanks to Sylvia Duckworth and her inspirational images. This is an area that I hope to continue to build knowledge around to better support colleagues and students. I was never a strong math student. I did not feel very confident about my abilities. I remember being able to do the work when my teacher was standing beside me but when I was left to work on my own, I struggled. In recent months, I have taken Math Part 1 and have attending several math-focused workshops. I love the direction that I am going in with my math program. I look forward to next year, when I will present my students with more real-life problems that they will work on and solve at their own pace and in their own way. I also look forward to listening to them talk about their thinking. I have definitely moved toward a growth mindset in all areas of my program. There is still a lot that I want to learn about the thinking behind growth mindset but I love what I have learned so far! I hated math. It seemed mythical to me but I was in French (and struggling) so I think many concepts that were abstract when I didn't have language fluency made understanding twice as difficult. In high school, I was in advanced math but they were going to fast for me. Everyone else would be done as I struggled through. I went down to general math but found it too boring. I always wished they had advanced for dummies... (like the books) so I could learn at my pace but still get the content. I definitely had a fixed mindset. In special ed, students struggled but I learned that with multiplication each child learned their tables differently. Some could memorize, some added 4 six times, some needed manipulatives others a whole new method. That's when I realized Students could absolutely learn the content, I just needed to figure out how to teach it to them to make sense. I've changed my math outlook. I've seen the difference with my students. They ask to do math. They see themselves as math explorers. I want them to feel positive and engaged with math in a way that was never suggested, lived or said to me as a child. I definitely struggled with math all throughout my school years, and I know I have a fixed mindset even now (although I am working on it!). I still feel embarrassed and flounder when I make mistakes, and even though I always say to my students that it's okay to make mistakes and they help us grow, I find myself needing to heed my own advice. I think if my own mindset changes, I can approach math in a more positive light for my students. I would say that I was good at math, so I liked it... things just came to me, so I guess I didn't work very hard at it. I never understood when people said they didn't "get it" - I guess I viewed it as something that came naturally to me. (Though, as someone else mentioned, I did have a "blip" in grade 10 math when it came to proving two triangles were the same - they just were, I knew they were, so I struggled with providing a proof). As for my mindset, I guess I never really thought about my math-specific mindset... I would think I would be willing to take risks, but would I be disappointed if I failed? Probably. Would I use it as a learning experience? I hope so. Would I try again? I believe so. Deanna, I had the same experience as you. I loved math until I got a Grade 11 teacher who was in his last year before retirement. In retrospect, I can tell he was once a good teacher who was burned out and phoning it in. I fell so behind that I could barely pull down a 60 in math, and I opted out of physics and finite classes in OAC. I decided I just didn't get math and my goals of being a scientist evaporated. I still don't feel confident in my skills, but I know they will develop as I work at it. I always liked math but never felt confident in it. I had the opportunity to team teach with a colleague (I had a 2/3 she had a 3/4). We had 50min everyday with my class and her grade 3's. We did number talks, fosnot problems and dived into the math. Now math is my go to. Everyone knows that I incorporate math thru everything. The kids love to hear during a read aloud "I smell a math problem". My mindset has grown and my teaching is better for it. I believe everyone has the potential to learn! I love math! Am I great at it? Nope lol but after reading more about having an open mindset I think this is why I like math so much. I do not have a fixed mindset when it comes to math. Dweck's work is discussed in regards to the impact of fixed vs growth mindset. Boaler identifies 'fixed praise' as a contributor to fixed mindsets. What aspects of mathematical learning do you praise? Think of some of the phrases you make use of, are they related to a fixed or growth perspective? With art, when they ask do I like it... I ask them do you like it? Because it's important that you are satisfied with it? Did you put a lot of effort and time? Did you make something new or try something new technique, fold, cut, marker etc? It's hard not to say you're smart especially with students who do not get any recognition at home. But I say pat yourselves on the back. That was well done work. What an amazing effort. I see how far you've come. We do a lot of next day regrouping to examine students answers and examples of different thinking. We've been using Marion Small's book with open ended questions which lets students have many different solutions. It helps students think beyond there's only one right to do this math. I participated in a PD session this year on number talks - this is a math focus our school is going to look at more in depth next year as part of our school improvement plan. One of the strategies the leader of the session modeled was when she poses a problem to the students, she writes down all of their answers (right or wrong). She doesn't say anything, nor are any other students allowed to comment or critique. The teacher may ask the student to explain how they got the answer, or explain their thinking. The idea is that every student's answer, or thinking, is valuable, and something can be learned from each one (even if it isn't right). Ideally, the teacher is going to present problems that he/she knows the students will be successful at (gradually increasing the complexity of the problem) - this will also give you an idea of which students need more time on a concept. My go-to phrases usually are about the task rather than the child, but I think I'm going to have to make and post a list to remind me to make sure this is happening, because I'm sure "you're a smartie pants/smart cookie" does come out! It sounds harmless and encouraging, but it's certainly something to keep an eye on! Most teachers approach mathematic instruction based on a course of study where strands and topics are taught in isolation, and are rarely revisited. How can we rethink our approach to mathematic instruction to support the formation of structural pathways and long lasting connections? Coming from 15 years of kinder three years ago into grade one I tried hard to follow our boards math delivery plan but I found it impossible. Coming from kinder where you teach all of the strands all of the time It made no sense to me so I've approached all my math as authentic experiences rather then math lessons in my room. I've learned to embed things throughout my day that link to the strands so that I'm always revisiting the language required over and over so that all kids have a chance to be successful! For instance we keep tooth tallies for lost teeth and we graph weather and pizza orders so data management is visited regularly! I don't "teach" then but we explore, uncover or "do" it and my questions build as the year progresses. I'm just worried I don't have enough problem solving embedded naturally into my day so that's my focus this year! Lori, this is so great to read! My school announced at the last staff meeting the expectation is now that the first 100 minute block is to be our 'math block' so that children can have a good deal of time to engage in math explorations and consolidations. What I loved though was that my admin said that really math should be in every aspect of programs and that it isn't defined just by that block. The block is there as an expectation but really effective programs embed math and literacy into every aspect. I don't have my day divided by subjects anymore jsur large blocks of play/inquiry so I can get math in everywhere! I just wonder if not having a math block will be acceptable in grade one with the governments latest thinking. I try to teach in blocks that are related.. I am from Saskatchewan, not Ontario but we still have number of minutes per week that need to be spent on each subject area. This will be my first year teaching mathematics to grade one students and I will be doing so every second afternoon. The schedule is from 12:55 to 1:45 (math), 1:45 to 2:05 (school wide reading break -students reading independently), 2:05 - 2:20 (recess) and 2:20 to 3:07 (math). I am playing around with a few ideas but I am thinking I will begin with a read aloud to tie literacy to math and determine the math that can be found in the literacy. Possibly a large group mini lesson followed by authentic math invitations ending with sharing. Returning after recess I thought I may begin with a Quick Draw from Grayson Wheatley followed by authentic math invitations yet again and then sharing. I feel that with this schedule I will be able to engage in all strands of the math curriculum each day. What do others think of this? I will only have grade one for this math block time so I have less opportunity to integrate other subjects on a large scale but can include them as long as math is the primary focus. On paper, I have two large blocks--one for language and one for math. Looking around my classroom though, one can see that this is not what actually happens. This doesn't really work well with the Inquiry learning that I like to participate in. I am glad this question was asked. When looking at and developing my daily/weekly plan in the future, I will no longer feel pressured to write "math" or "language". Of course, I will have what my focus is but I won't worry about how my day plan "looks". In the past, I have thought about covering a different strand each day of the week but I am not sure that I will actually work. E.g Mondays: Patterning Tuesdays: Geometry; Wednesdays: Number Sense... This makes math feel less organic to me and I am not sure it will work with the new reporting that is now happening in Ontario. I think I want math to "just happen" throughout the day. I want my math program to come out of the conversations that we have in our class. I hope that I am moving in the right direction...?? I'm struggling with similar questions -how do I blend the inquiry learning with a specified math block? And how do I ensure that we're covering the curriculum with inquiry style math? I like the idea if doing a strand a day, but maybe just as a math prompt each day and then seeing what comes out of that? But its still very set blocks of time. .. Sitting in PLCs for the last few years as a kinder teacher made me realize what students needed more to be successful but also what would work best for them. Math has been my (unofficial but always in the back of my head) focus for several years now. I worried that maybe my old math fears were still prevalent in my teaching without me being aware if that makes sense. I wanted to be an excellent math teacher but also change how children see math. Not as a chore. Not as a scary monster but as an every day, everywhere you look part of life. Math is fun. Math is needed to buy groceries, sort your fruit, figure out who likes which fruit better... (I'm saying you what I'm sure everyone knows)... inquiry based learning has this all embedded in it. But I wanted and still want to add more layers and help students integrate these skills into problem solving which is a key concern with the grade 3's and 6's at our school. Erin, I have the same questions/struggles right now. I try to embed as much math learning into authentic classroom experiences, but I often wonder if I am covering it all. This year I did more math prompts/problems and the students were really engaged by those tasks. So many good points and questions... I don't think it makes sense to do patterning this week because the math program says so when we should be talking about measurement because we are watching our plants grow in science... math should be able to happen all day, every day! BUT - what about those admin who REQUIRE a planned day plan that outlines math BEFORE it happens? What would you do if you were unexpectedly away for 3 weeks?? Would saying "just see where the math takes the children" fly at your school?? I've had admin who went both ways on this, and I am now wondering what the best planned approach is? I know at the end I can look back on documentation to see I've covered it all, but at any one given point, would an admin agree? I'm moving from Kindergarten where we embedded Math in everything, to Grade 1 where I will be teaching Math (and only Math) to 4 different classes. So I only have 1 hour/day that I see each class. Like Lori, we tracked different things (hoping I might get the kids to a place where they can do this at other times if the day) but as much as I want to try and work with the other teachers to match the math to their work in Science and Sicial Studies, I think I'll be doing a lot of instruction in isolation. Not sure how I can't. And with 4 classes, I'm not sure I want to drive myself crazy teaching the same strand at different times. Any suggestions? I have began to plan differently so that I can maximize the authenticity of math. I don't teach the strands separately. At first when I went to reort on the kids I was overwhelmed feeling like I didn't hit all the strands. Then I broke down what I knew about each kids from doing number talks, word problems (individual and partner questions) and realized I had a wealth of knowledge. I take big ideas (ie: quantity) and weave all the strands. I'd heard of teachers who did a strand a day, throughout the week.. thought I might try it a few years ago... but found it was difficult... that was a grade 2/3 split class.. to much going on I suppose. In Number Sense, particularly, it's easy to cover it with the other strands, but things like Geometry or such as more specific and condensed in a way that it would be hard to spread it out over weeks rather than making it the focus of a 3 week block of time or such. I think I started out thinking I was 'good' at it, but by grade 10 it stopped clicking. Looking back, I realize that some of the problem was how it was being taught. Now that I teach math, I feel like I'm learning tricks that would have helped me so much, but was never taught. I still panic when I have to make change (money). Someone shared a few tricks with me and it helped so much, but the fear of making a mistake is still deeply engrained. Teaching math has definitely helped me go from fixed to growth mindset though and I'm determined to provide a growth mindset example and environment for my students. We usually have a 100 minute block devoted to math. I like to work on subitizing, number talks and math games throughout the year and then have a strand that we focus on for a while. I find that focusing on a strand gives us the opportunity to learn and use related vocabulary, engage in rich conversation and tasks and have a deeper understanding of the math concept. We make sure that we include other strands when applicable as well as student interests. We also try to plan provocations for the students to explore during play and engage in authentic math experiences throughout the day. I really like the way you have broken this down. Is this in an FDK classroom? If so, how do you manage 100 minutes of math during play? Also, when you focus on a particular strand, do you work with small groups? We usually have a small chunk of time before recess or planning time to subitize or do a number talk lesson. Then the students play with classroom toys, math manipulatives or math games with my partner or I. This is our time to introduce new math games with small groups or work on number or subitizing concepts with individual or small groups of students. After recess we do our focused math lesson on one particular strand. Once the lesson is over, we have a few provocations set up around the room that the students can choose to work on, some students work on the "action" part of the 3-part math lesson with my partner or I, other work with the remaining educator on their math journal, others play favourite math games or choose free play. We try to capture their learning using pics and video and then discuss as a whole group before tidying up. It is an FDK classroom. I love this!Thank you - I have heard about other schools having a dedicated "math block" each day, but wondered what it looked like in FDK. Would love to incorporate something like this in my own classroom next year. What do you do for math journals in your room?? It has taken a lot of tweaking to get to this point. This year I'm going to learn more about learning trajectories and interactive math walls and try to incorporate them into my teaching. It's funny how you never know if you are doing it "right." We have an amazing administrator who used to be a math curriculum leader at our board office and she shared some great ideas about math jiurnals with me. She suggests keeping the question/prompt open and accessible to all students. They can answer with pictures (drawn or ones they take with classroom iPads), numbers and words. We work with the students in small groups and make obserational notes while they work. Some questions/prompts might be what has a large capacity? Which container has the smallest capacity? Which container do you think will have the largest capacity? Why? How are a triangle and a square alike? More and more I try and praise their hard work and perseverance. "I like how you kept trying", "You worked hard". They really light up with this type of praise. As a teacher, I just need to remind myself to slow down and then I'm less likely to use praise that is more fixed mindset than growth. I'm trying to incorporate more of the math strands into inquiry, however I still introduce some strands and set out games and related provocations outside of our inquiries. Sorry that my questions are not up yet for Chapter 2. I sent them to Deanna early this am and will wait for her to post them once she has created the Chapter 2 banner. In the meantime, enjoy your weekend! My MISTAKE...not noticing that I was supposed to send them 3 days ago. Whoops...but boy are my brain pathways lighting up! -praise giving from parents between birth and 3 predicted their mindset years later (WOW!) Just think about how our praise in the early years is impacting our students mindsets. -praise for intelligence (you are so smart) rather then effort (that is an amazing piece of work)creates a "fixed amount of ability" for students. I am very aware of how I praise my students and my own children. I still catch myself saying things like "you are so smart" so I follow it up with "you should be proud of all your hard work on -------". The more you correct this type of praise the more natural it will become. Hi everyone. I have been away most of the summer but picked up the book in early July and have been following along when I can. I absolutely love the book. Her take on learning mathematics is blowing me away, particularly when I think back to the math teaching I supported this past year (Grade 7). I wonder though, and hopefully this will be answered later in the book, how students would fair going from a math classroom taught in the Jo Boaler way to a traditional classroom in the following year.